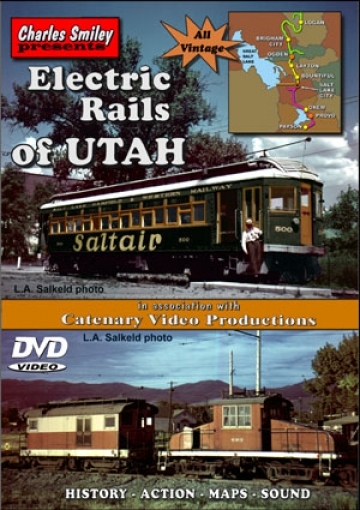 Utah was a state with multiple electric interurban lines. These railroads were in service for over 50 years. Looking back over 60 years to see, and even ride the old trains, is a rare opportunity from Charles Smiley. The all vintage films will transfer the audience to a time long past into history. Here are the railroads we visit in Utah. If the location and era seem too strange, no worries. A PBS style format, will be used to organize everything, into comfortable viewing. Actually, when Charles Smiley is often compared to say, Public Broadcasting Service, it is for a common point of reference. A CSP program will always have it’s own unique stamp of character. There are certain touchstones for CSP. Digitally remastered films, that consistently convey the best possible image. Consider, this is from a plethora of varying quality sources, from many decades. Audio will be appropriate for the scene. Whether it is dubbed, natural or musical, the soundtrack enhances the show. Supportive materials that add to the story. A combination of : still photos, illustrations, and even original railroad artifacts, that are skillfully interspersed within the story. All smoothly edited into a comprehensive whole. Custom made and labor intensive maps, are a CSP hallmark. Any viewer will have no problem following along with the plentiful maps. They are referred to frequently. A chapter menu is included, and some previews of other shows. 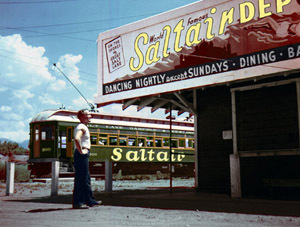 The Saltair was a nickname for, The Salt Lake Garfield and Western. The Saltair is featured in one chapter. 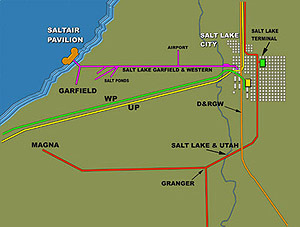 The Saltair Pavilion was located at Salt Lake, see the map. History of the line, and the route, is covered. A motorman’s view of the trip. takes us out there. The railroad survived with freight traffic. Morton Salt was an online customer. 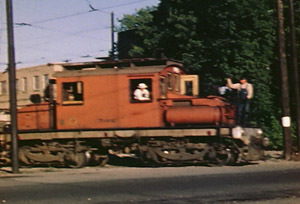 Operations in the 1970’s are also seen. Charles Smiley narrates the show. The narrative is extremely informative. His style will be n additional journey within the show. At times he is a a historian. Av thorough foundation is laid. Building upon a basis, not automatically a historical one, a vehicle can be used to communicate a high degree of information. Naturally, trains are often the vehicle, but not always. In fact, in this show, the viewer will sometimes have the viewpoint of a pedestrian. A nice counterpoint, to the viewpoint of a trolley motorman, or a mineworker on a shift change. In this show, the subject interurbans get full coverage. Radiating outward from Salt Lake City, we travel on many lines. Various towns are destinations. One town in particular, Bingham has completely gone out of existence. Kennecott Copper swallowed it. Salt Lake & Utah Railroad had this colorful sunburst scheme for improved visibility to automobiles. Car and trolley collisions were a daily hazard. Bamberger Railroad was a large line. Utah’s electrics often had freight business. Large freight motors also pulled heavy wartime passenger moves. Bamberger gets extensive coverage. A memorable destination was an early amusement park. The Lagoon is shown, in a then and now segment. It was one of the first of it’s kind, in the western states Fast Brill cars could achieve 75mph. 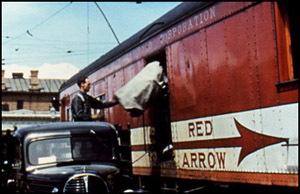 Unpowered trailer cars were for high passenger traffic.Street footage is seen around salt Lake City. 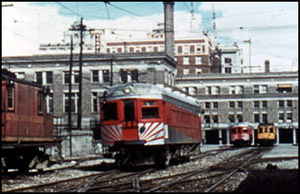 The passenger service was discontinued in 1952. Utah Idaho Central Railroad ran all the way up into Idaho. Some front window film gives us the feel of crossing the countryside, back in the day, before major highways. 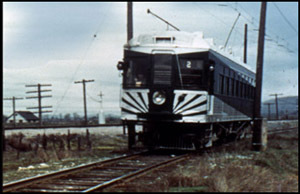 Kennecott Copper had electrified rail service. It’s massive open pit mine gets an extended feature chapter. The highly detailed visit, will give a wealth of knowledge on this operation. The KC had used Alco RS3 diesels too. Unique adaptations of the catenary are discussed at the mine. The mine lecture, will impart an understanding of open pit mining, and the copper industry. A visit to Nevada looks at a smaller KC location. Film quality is generally excellent. The 16mm is superb. The 1920 film is clear, in black & white. Some trolley footage is below these high standards. Considering the timeframe of pre-1950’s, we are fortunate to have this collection of films. There is even more within this fine show, than I can list here. Nevada Northern has a visit for example. Updated to 2006, where to find trolley survivors is another. This is a ‘must have’ for trolley fans. An excellent interurban program from Charles Smiley. This entry was posted in ATVR Reviews, Charles Smiley Presents and tagged American Train Video Reviews, electric, PBS style, Railroad, trolley by William J. Hudson. Bookmark the permalink.